If you’ve ever grappled with putting pen to paper to write a script, creating a show with just three words may sound like a bit of a shortcut. But, as acclaimed theatremaker Tim Crouch explains in this exclusive article about his brand new tri-worded family production, it may be fun but easy it’s not. The action of the play was a series of gentle games played between the three characters and a sheet. I loved the simplicity of Gary’s idea. I loved what the application of this formal restriction did to these characters. Purni asked if I’d like to direct it. We thought that it should be for anyone over the age of three. I met with Gary in Cardiff and he agreed to extend the scenario of the sketch to 50 minutes and I set about looking for actors. Last September Gary and I spent a day with three actors and the designer Lily Arnold. It was meant to be a workshop audition, but I didn’t really have any other actors in mind. I’d met two of them, Amalia Vitale and Fionn Gill, through my work with [theatre company] Spymonkey. The third, Dorian Simpson, had been recommended by Gary. Such was the distinctiveness of those three actors that Gary went away from the workshop and wrote a whole new play for them. The formal restriction of the three words remained, but the sheet was gone. Instead a beach, a game of imaginary tennis, some badminton, a dance, a snack, a ‘family’ day trip. I traded a short rehearsal period for more previews. It felt like we wouldn’t know what we had until we put it in front of an audience. We had permission from Gary to explore freely and so we started 10 days of rehearsal with a very open mind. And that openness has extended to the first preview – and into the audience who then return it back to us in the most astonishing way. I hope it will carry on to the last performance. Our references for Jeramee, Hartleby And Oooglemore include Jacques Tati, Martin Creed and Pingu. 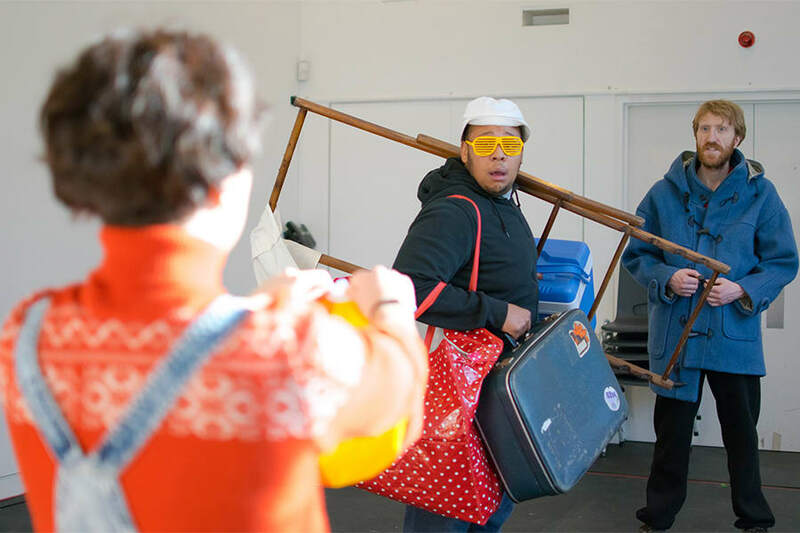 In rehearsal we played a lot of games and we’ve learnt to hold our nerve around openness, clown and deep emotion. We’ve taken the formalised loss of language that Gary has given us and extended it into a game of losing and finding – with all the contingent trauma and elation. We have also, unusually for me, found ourselves consulting Amalia’s copy of Actions: The Actors Thesaurus. In a play where the vocabulary extends to only three words, we’ve needed to know the psychological action behind those words each time they’re spoken. Above all, we’ve had more fun than I thought was allowed in making a play. The whole thing would be completely different with different actors. They have made it what it is, and they have done so effortlessly. If I have done anything right on this show, it is the casting. Come and see them. They are completely Jeramee, brilliantly Hartleby and totally Oooglemore. 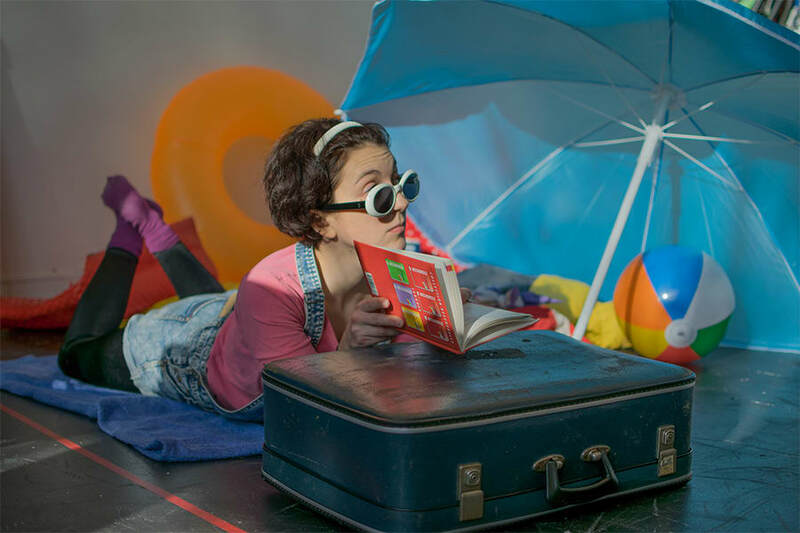 Jeramee, Hartleby And Oooglemore is recommended for ages 3+ and plays at the Unicorn Theatre until 15 March. You can find out more about the show in the rehearsal video above. Book tickets to the show from the Unicorn Theatre website.